9'3"w displays can be seen from far away. Transport case keeps materials organized while traveling to a trade show. Tubular frame View Setup Instructions; no tools needed. Stretchy material pulls a message taut, making it viewable by all. These custom booth displays offer a way to present eye-catching graphics, without sacrificing presentational space within your booths. 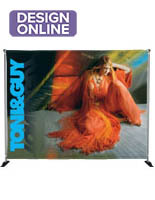 The backdrop banner stands measure just over 9 feet wide and feature a curved design to center around a demonstration. These custom booth displays, also known as exhibit booths walls, are equipped with custom-printed graphics to add a personalized element to a tradeshow event. Simply follow the guide and submit your specifications after purchase. These custom booth displays are formed through a dye-sublimation process, creating 600 DPI images, which are brightly-colored and detailed. 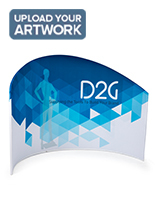 The portable banner stands use a stretch fabric to pull graphics smooth, which will eliminate wrinkles completely. 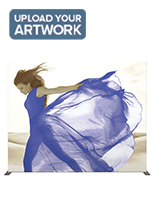 The pillow-case-like design easily slides over top of the aluminum framing. These custom booth displays therefore remain perfectly in position throughout an entire exhibition. The custom booth display fixtures knock down into individually-labeled parts for easy storing and hauling. Each piece attaches together with the snap of a button. 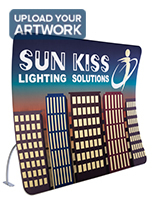 These custom booth displays are incredibly portable and do not require any additional tools or hardware. There is even a shipping container provided to store your equipment during travel. 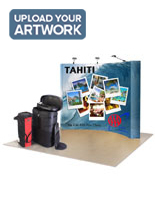 These custom booth displays give users the ability to incorporate a company's logo or catchphrase into their exhibit booths in a stylish manner. 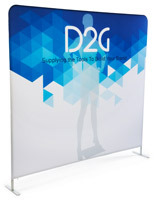 The concave design provides enough area for presenters to stand in front of the wall or for additional accessories, such as a literature rack or folding table. 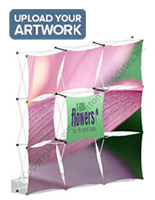 These pop up displays create a seamless backdrop that will garner the attention of passersby!